I just received notice that I won a Giveaway over at SewCalGal. That was a nice little surprise. The giveaway for this week was for a choice of quilting books. I chose the book Baltimore Blocks for Beginners: A Step-By-Step Guide. 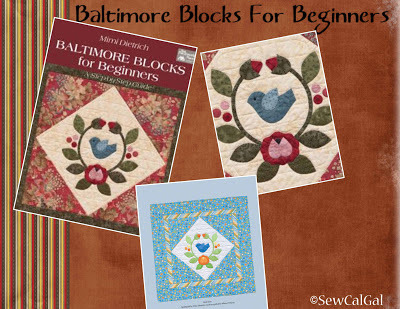 I love the look of the Baltimore Album quilts, but wouldn't know where to begin. Now I'll have a book to begin with when I'm ready. If you don't already, I would definitely recommend checking out SewCalGal's blog. Hi Sylvia, I am happy I found your blog. I have enjoyed browsing your blog and look forward to future posts. Found you through Marcia's Linking Party and just became a Happy Follower!